This entry was posted on October 7, 2014 by Jessica Anderson. Right now, our shelves are full of trophies and awards that will be handed out to deserving kids for a great fall sports season. Most of the kids will be excited to get their trophies, but will they like them in a year? What makes a trophy have meaning over time? The things that count are (1) what the award represents and (2) how it is presented to the player. Even though we are a trophy and awards company, don’t give out awards if they aren’t meaningful. It gives our industry a bad rap. My daughter being congratulated by her teacher for her first place win. For example, my daughter’s dance team didn’t do as well as they hoped at a competition last year, yet everyone received a trophy. My daughter was extremely mad at the trophy; she said it didn’t represent anything, and she didn’t want anything to do with it. In the long run, I think the trophy made her feel worse than if she hadn’t received anything at all. 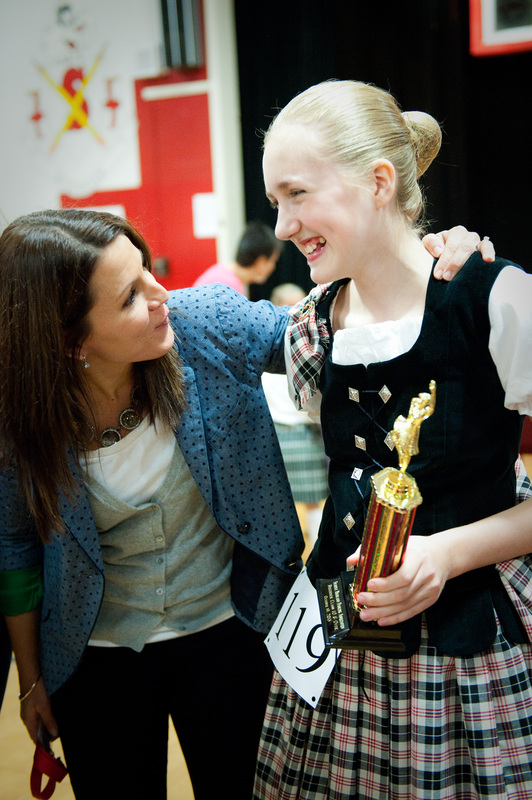 However, my other daughter competed in a dance competition and received 1st place in her division. Places 1st thru 3rd received medals, but she was the only dancer in her division who received a trophy. Those awards, including her medals, are given a place of honor in my daughter’s room, as she feels extremely proud to have won them. My bet is that she will save that 1st place trophy forever. A trophy or award isn’t inherently meaningful. It is plastic, wood or metal in a colorful shape with some engraved words on it. What makes it meaningful is what the trophy represents. For a younger child receiving a participation trophy, it’s a symbol for the season – the games played, the skills learned, the friendships forged. For the parents, it’s the hours endured driving to practices and games, watching your beloved child win or lose, happiness and tears shed. Participation trophies represent a season passed, and that memory is what can motivate a child to continue playing the game in the future. As the child gets older, they may stop receiving participation trophies, because they aren’t as meaningful as when they were younger. Instead, older players get tournament trophies for winning – their division, their league or being the MVP of their team. At this phase in their sports career, accomplishments, such as overcoming an injury, beating worthy opponents, and being the best are what make a sports trophy meaningful. These trophies can become cherished items that last a lifetime, as they become mementos of glory. 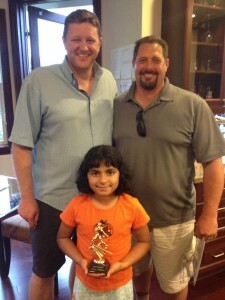 Coach Jeff and Coach Mike present a trophy to one of their softball players. 2. Prepare. Spend some time thinking about the highs and lows of the season, and what each player contributed to make it memorable. Have the trophy presenter write down his or her thoughts ahead of time. 3. Have a ceremony. Whether it’s on the field, at a player’s home, at a pizza parlor, or at an awards banquet, have the coach stand in front of the group and individually call each player to receive their award. 4. Recap the season. Before handing out the trophies, talk about where the team started and where they are now. Briefly hit the highs and lows of the season. 5. Tell a personal story about each player. Talk about their strengths, specifically how they added to the team or their most memorable moment of the season. Then have the player receive their award and shake the coach’s hand. 6. Write it down. If you really want to make it meaningful, have the coach or presenter write down their praise about the player. Then the player or their parents can put it in a scrapbook to remember for years to come. Don’t let the trophy you buy be a dust collector. Let it represent something great. Buy it for the right reason in the first place, and then put some thought into how you can capture the meaning around it through words of praise. That is what transforms a sports trophy into a cherished keepsake.